We all seem to need a little more space, especially in the laundry room. You can easily maximize your laundry space by stacking your dryer on top of your washer with this durable Stack Kit. The kit supports Alpha Heat Pump, Hybrid, Long Vent and Standard Dryers. Replaces W10298318RP and W10761316. Will this work to stack Maytag MGD9000 dryer and MHW5500FW? Hello Erin! Yes, W10869845 will work for your Washer and Dryer. Thank you for your inquiry on our Whirlpool appliances. Will this work attaching a MED5500FW to a MFW9700SQ1? My mother's current dryer (MED9700SQ0) gave out on her and we were considering the 5500 as a replacement. Yes, this stacking kit is compatible. Hello tony! Yes, this Stack Kit will work with your model. Thank you for your inquiry on our Whirlpool appliances. 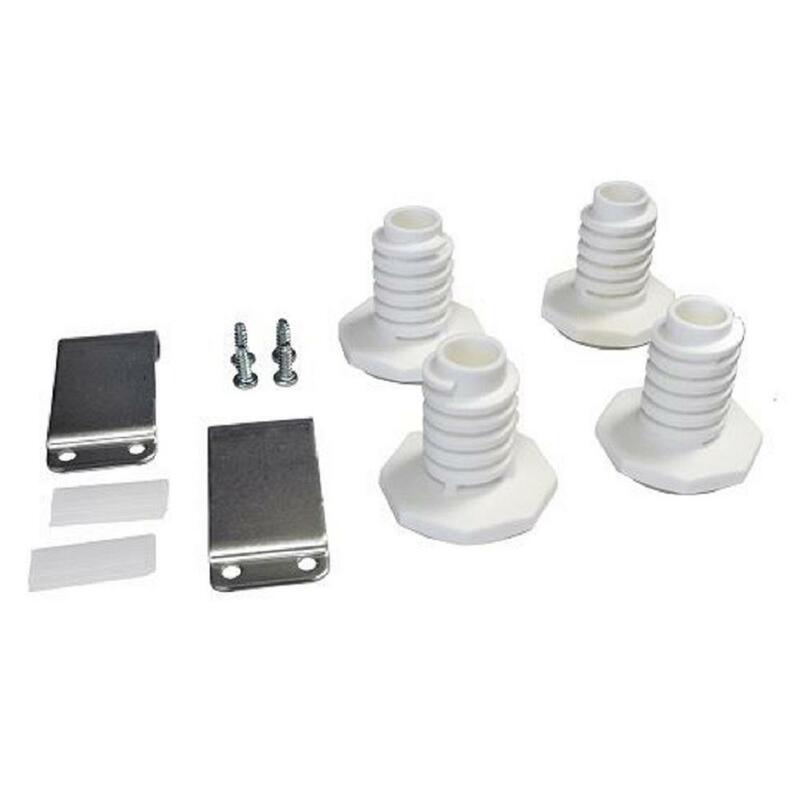 Ellison, this stacking kit will work with your Washer and Dryer. We hope this helps! Front Load Laundry Stack Kit is rated 3.3 out of 5 by 27. Rated 3 out of 5 by Stephanie from They seem to be holding— though I should probably have... They seem to be holding— though I should probably have an actual professional come and inspect it as everything else the HD install team touched was done incorrectly. Rated 1 out of 5 by Goatbreeder from I just bought a whirlpool stackable washer/dryer. I refuse to pay $50 for a couple trinkets that ... I just bought a whirlpool stackable washer/dryer. I refuse to pay $50 for a couple trinkets that should be included with dryer. In fact I wouldn’t have purchased this set had I known how ridiculous this kit is. The plastic feet with the rubber grip surface come on the washer, why not the dryer? And the little brackets with 4 screws are literally pennies of cost to whirlpool. I have stacked my units without this kit and has been fine for months. I have swampland for sale and encourage everyone stupid enough to allow this ripoff from whirlpool to get in touch! Rated 5 out of 5 by Control from We were a bit unsure that this kit would actually work to stack our new machines, but were pleasa... We were a bit unsure that this kit would actually work to stack our new machines, but were pleasantly surprised at the ease of installation. Our machines are working beautifully and the amount of space that is saved for something else is a plus! Rated 3 out of 5 by John from Got the job done, but $40 for $5 of hardware... Got the job done, but $40 for $5 of hardware feels like extortion. Rated 5 out of 5 by Meebers13 from It's been a month and everything seems to be working... It's been a month and everything seems to be working okay. Rated 4 out of 5 by BKBOOMER from Holds the washer/dryer in place and is grounded well.... Holds the washer/dryer in place and is grounded well.